PDF Imposition Software (A-PDF N-up Page )is the most powerful and easiest-controlled imposition software that allows you to batch output N-up imposed PDF files It is as simple as the operation drag-and-drop. PDF Imposition Software also provides combining multiple pages to create booklet. Besides, you can do some special arrangement to the pages. 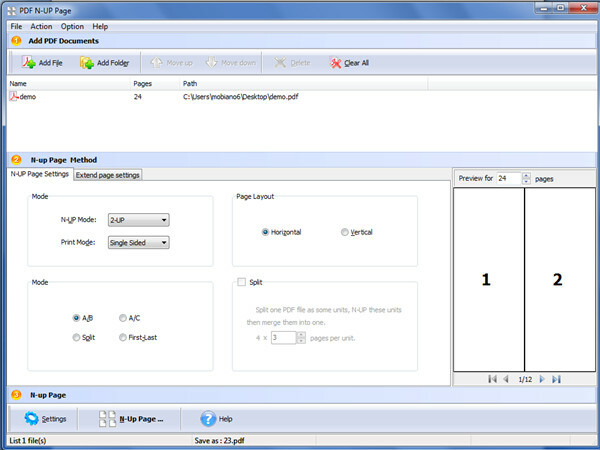 As a matter of fact, PDF Imposition Software is the easiest tool without any comprehensive and professional operation. It enables you can impose PDF pages into one page as soon as possible. Create 2-up PDFs or 4-up PDFs. Four imposition modes are provided: A/B, A/C, Split and First-Last. Two options for layout: Horizontal/Vertical. Support the setting of gutter, OMR mark margin, barcode. Support the setting of page sizes, page range and page rotate. Automatically choose the latest user choice. PDF Imposition Software gives you a new idea of imposition without the comprehensive procedures. It can help you batch N-up numerous PDF files at the same time.In addition, PDF Imposition Software is an independent program without the support of Third Party Application. In this way ,you can save both time and money.